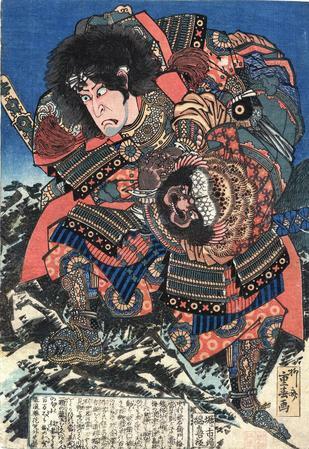 Print: Nakamura Utaemon III (中村歌右衛門) in a kabuki role. This may well represent a performance at the Horie Ichinogawa theater and may be the right hand companion to another print in the Lyon Collection, #1295, even though the shape of the cartouches are somewhat different. The publisher is Wataya Kihei.